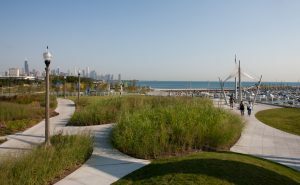 Across the city, the Public Building Commission and the Chicago Park District have joined together to increase and enhance the settings where residents can exercise, frolic, gather or just relax. With the construction of new Park District fieldhouses and improvements to existing facilities, Chicagoans have a wealth of options when looking for a place to play. The PBC continues to design, build, update, or enhance parks or structures to better serve the residents. New facilities with fullsize gymnasiums, fitness centers and meeting rooms are planned for several locations, and improvements to existing Park District sites can include the addition of concession stands, restrooms and even outdoor showers. As a result, the Park District can offer parks and buildings that can accommodate more residents of all ages, while introducing new programming and activities, such as concerts and fitness classes. Further, the designs for all new fieldhouses include features that qualify the building for certification under the U.S. Green Building Council’s Leadership in Energy and Environmental Design (LEED) standards.